Field Projects is proud to present Show #19: Homunculus, a solo exhibition featuring new works by Caroline Wells Chandler. 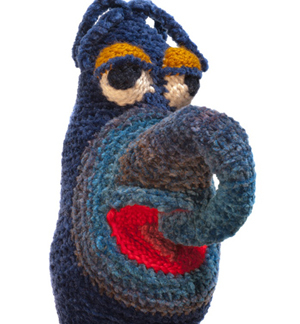 Homunculus opens Thursday, April 3, 2014, with an opening reception from 6:00-8:00 pm. Chandler's recent work investigates art as psychoactive substance igniting a psychedelic experience— a process by which the subconscious reveals itself to the conscious mind. Drawing from Americana such as Jim Henson’s Muppets, “selfies,” and craft store paraphernalia, Chandler's work manipulates clichéd images into totally immersive objects that saturate the viewer. In Homunculus, anthropomorphic guides from yesteryear sprawl on the floor and slump in corners with paralytic self-reflexivity. Head-shop tchotskys ooze from saccharine double rainbows, while trompe l'oeil comfort foods float above- and grimace back- reassuringly. Chandler’s sculptures, made from re-appropriated icons of contemporary culture, transform the familiar and recognizable into the unnerving and surreal. Caroline Wells Chandler (b. 1985) received his Bachelor of Fine Arts from Southern Methodist University, and his Masters of Fine Arts from Yale University, 2011. Chandler was awarded the Yale Ralph Mayer Prize for proficiency in materials and technique. He lives and works in Queens, NY. This is Field Projects’ first solo exhibition, marking the space’s new direction in programing. Caroline Wells Chandler was selected through Field Projects’ Open Call process.